Published: Jan. 7, 2018 at 06:42 a.m. Updated: Jan. 7, 2018 at 01:15 p.m.
LOS ANGELES -- He has felt the sting of postseason heartache more acutely than any coach in recent memory, having twice watched apparent Super Bowl triumphs disintegrate in surreal fashion. So when Dan Quinn walked into the Daily Grill restaurant inside the Westin Los Angeles Airport on Friday afternoon with his wife, Stacey, for a happy-hour snack, it would have been perfectly understandable if the Atlanta Falcons' third-year coach had discussed his team's impending playoff date with the explosive L.A. Rams in stoic and cautious tones. The Falcons, after all, had survived a choppy and challenging regular season, sneaking into the postseason as the NFC's No. 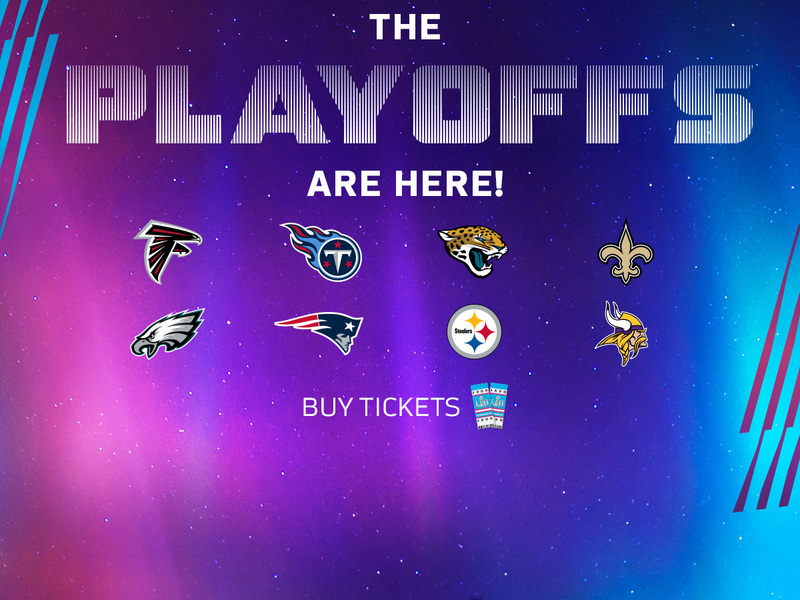 6 seed only after defeating the playoff-bound Carolina Panthers on the final Sunday. And, in the eyes of many, they'd still failed to present a convincing case that they'd recovered from the emotional wreckage of the previous February, when they completed the biggest collapse in Super Bowl history. On a star-studded Saturday night in Tinseltown, with Snoop Dogg as the halftime performer, the Falcons would take the field as underdogs. Yet Quinn, a blue-collar grinder from Morristown, N.J., wasn't about to roll over and play dead, even for effect, as he entered the Daily Grill. "We just put two great weeks of practice together," he said. "I wouldn't want to play us right now." A little more than 24 hours later, the Falcons charged out of the north end-zone tunnel at the Los Angeles Memorial Coliseum with purpose, intensity and focus. Then they went out and fulfilled their coach's prophesy, defeating the Rams by a 26-13 score and advancing to face the top-seeded Philadelphia Eagles in next Saturday's divisional round. With Philly still reeling from the season-ending injury to star quarterback Carson Wentz -- suffered at the Coliseum in a December victory over the Rams -- the Falcons suddenly look quite capable of advancing to a second consecutive NFC Championship game. As Atlanta proved on Saturday, despite a regular season full of static and sharp crescendos, this is a team that knows how to turn it up at the right time. "Absolutely," said quarterback Matt Ryan, who completed 21 of 30 passes for 218 yards, including a fourth-quarter touchdown throw to Julio Jones while falling onto his back. "We're a battle-tested group that's been through a lot, and we thrive in those situations. That's a reflection of (Quinn). That's him: 'Who cares? The bigger the situation, the more we're gonna lock in and do what we do.'" As we stood outside the Falcons' locker room following Saturday's game, I asked Quinn to explain the source of his confident proclamation the previous day. "It's because there had been a shift in our team, and I recognized it," Quinn replied. "I think the shift probably took place for us after we lost at New Orleans (on Dec. 24). We had to play Carolina the next week with our season on the line, and we had to take a hard look at ourselves. "What I mean by a shift is, no more 'almost,' and no more 'except for.' We knew that if we really committed ourselves to getting the details down and eliminating mistakes, we'd be tough to beat. And trust me -- this team's been through the fire together. And when you come out the other end, there's a toughness and a togetherness that can be very powerful." When it comes to rebounding from crushing defeats -- and living with the almost and except for of confetti-deprivation -- Quinn has far more personal experience than he'd care to access. As the Seattle Seahawks' defensive coordinator three seasons ago, he was deprived of a second consecutive Super Bowl championship by a painful yard. Then, last February, his Falcons were blowing out the New England Patriots in Super Bowl LI, only to blow a 28-3 third quarter lead and lose in overtime. When cutting-edge offensive coordinator Kyle Shanahan left to become the San Francisco 49ers' head coach, some degree of upheaval seemed guaranteed. 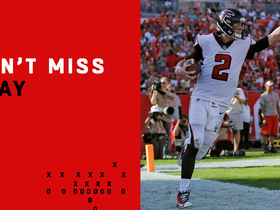 Sure enough, the Falcons' offense was less prolific in 2017 under new offensive coordinator Steve Sarkisian than it had been the previous year, when Ryan was the league's Most Valuable Player. Atlanta's fast and physical defense, however, is better than it was a year ago. 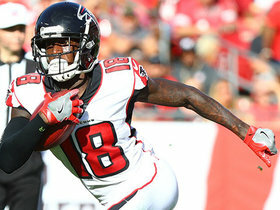 And on Saturday, against a special teams unit that was the class of the NFL during the regular season, the Falcons came up with two huge plays that set a tone for the rest of the game. First, Matt Bosher's punt bounced off the foot of the Rams' Blake Countess and was eventually recovered by the Falcons' LaRoy Reynolds at the L.A. 17. That allowed Atlanta to take a 3-0 lead on Matt Bryant's 29-yard field goal with 7:13 left in the first quarter, despite the fact that neither offense had registered a first down. Then, after Bryant's 51-yard field goal made it 6-0 with 1:23 left in the quarter, first-team All-Pro kicker returner Pharoh Cooper coughed up the ball on a hit from Damontae Kazee, and teammate Kamal Ishmael recovered at the Rams' 32. Eight plays later, running back Devonta Freeman (18 carries, 66 yards) scored a three-yard touchdown -- with a huge assist from Pro Bowl center Alex Mack, who essentially bull-rushed him into the end zone as 190-pound L.A. safety Lamarcus Joyner waged a losing leverage battle. "We weren't ourselves early in the ballgame, including myself," conceded Rams coach Sean McVay, who'll likely earn Coach of the Year honors for the dramatic turnaround he engineered during his rookie season. "Once we settled in, Atlanta made enough plays to beat us, which is why they're who they are. They're a team that played for the Super Bowl last year and fought through some adversity to get back to the playoffs, and they're very tough." The Rams cut the lead to 13-7 when second-year quarterback Jared Goff -- with whom McVay has forged a highly productive partnership since arriving as the youngest head coach in modern NFL history -- lofted a gorgeous 14-yard touchdown pass to rookie wide receiver Cooper Kupp. A 38-yard strike from Goff (24 of 45, 259 yards) to wideout Robert Woods (nine catches, 142 yards) set up Sam Ficken's 35-yard field goal with three seconds remaining, cutting the Falcons' halftime lead to 13-10. At that point, the Rams felt pretty good about their situation, all things considered. 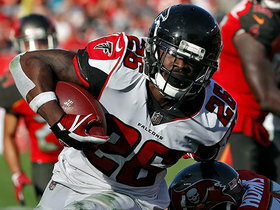 Quinn, however, felt even better about the Falcons' plan, which focused on containing the Rams' star running back, Todd Gurley (14 carries, 101 yards; four catches, 10 yards) while freeing up Freeman (18 carries, 66 yards) and fellow halfback Tevin Coleman (14 carries, 40 yards) on outside-zone runs. Credit Sarkisian with making smart halftime adjustments that allowed the Falcons to methodically move the ball, with Ryan repeatedly finding Jones (nine catches, 94 yards) and Mohamed Sanu (four catches, 75 yards) on underneath patterns. "At halftime I said, 'We get the ball first; let's go down and have a nine-minute drive to start the half,'" Quinn said. "And exactly what I hoped would happen, did happen." Technically speaking, the Falcons held the ball for the first 8:15 of the third quarter, driving 76 yards on 16 plays to set up Bryant's 25-yard field goal. Bryant's 54-yarder made it 19-10 with 19 seconds left in the third quarter, and after the Rams cut the lead to six, Atlanta responded with an eight-play, 83-yard scoring drive that essentially ended L.A.'s season. "We didn't play our best," Goff said late Saturday night. "I think Matt managed the game really, really well, and that speaks to his overall experience." Ryan's biggest plays came midway through the fourth quarter. On second-and-13 from the Atlanta 38, he flipped a short screen to Sanu, who slipped to his left and raced ahead for a 52-yard gain. Two plays later, on second-and-goal from the 8, Ryan faked a handoff to Freeman and rolled back to his right. As Rams edge rusher Connor Barwin charged toward him, Ryan planted his feet, but his rear foot slipped on the soft Coliseum grass, and his body weight shifted backward. No matter: Ryan lofted the ball to his right as Barwin arrived, and his star receiver caught it and swept inside the right pylon. "It was an added degree of difficulty," Ryan joked as he left the locker room. "I couldn't really see everything, but I knew I threw a good one." 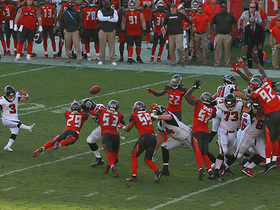 Said Jones: "I saw him fallâ¦ and then I saw the ball." The Rams had one last gasp, but Goff's apparent five-yard touchdown strike to tight end Tyler Higbee with 2:11 remaining was reversed on a replay review, and soon the Falcons were in victory formation and looking ahead to Saturday's showdown with the Eagles. "We're gonna have to do it the hard way," Freeman said. "Last year, we had a bye in the first round, and then we won two home games and were in the Super Bowl. But sometimes, you've gotta go the hard way, and I like these tough challenges. And at the end of the day, we're right where we want to be. "We're going into another tough environment, and basically, nobody likes us but us. People are gonna end up vibing on us, cause they don't have any other choice. We've been getting a lot of BS from people on the outside all year -- since February, really. But once again we're back in the playoffs, back in the second round. I'm super proud of us." As the Falcons filed out of the Coliseum and into the Los Angeles night, no one exuded more pride than their confident coach. He certainly has the steadfast support of his boss, Falcons owner Arthur Blank, who said of Quinn: "He's great at getting the team ready for games like this, for getting them in the right place. I think his experience in Seattle, and especially now in Atlanta, has prepared him for that. It's not a God-given talent; I think it's one you really have to develop. He's done that, and he's got us peaking at the right time." If the Falcons truly are peaking, they have to be considered a legitimate threat to win the conference, which would give Quinn another shot at Super Bowl redemption. It's a sore subject that he hasn't shied away from addressing, but one that he's perfectly willing to compartmentalize for the cause. "The resiliency showed by this team is what's important," Quinn said. "'Cause everyone wants you to get back to the Super Bowl and replay that, and you don't get to replay it. You learn from the scars, but you don't get to replay it. "I knew going in this would be a challenging season, and that our division would be tough. You've heard me say, 'The only fight that matters is the one you're in.' So when people bring up the Super Bowl? F--- that. We're not looking ahead. We're not looking back. We're looking at what's right in front of us." At this point, if you're still overlooking the defending NFC champions, you might want to reconsider. Rest assured they have the Eagles' attention.